Of the many birds that call northwest Ohio home, the most dramatic has to be the peregrine falcon. Certainly these raptors are the fastest of the aerial hunters, reaching speeds of approximately 200 miles per hour when they dive, and nearly 65 miles per hour in level flight. Between their hooked beaks and oversize talons, peregrines embody the role of successful hunter, diving down onto their hapless prey (medium-sized birds), with a midair clenched-talon power punch, then spectacularly retrieving its meal before it hits the ground. Despite this, and aside from a fierce territoriality regarding its nest and its chicks, the peregrine is recognized as the raptor most tolerant of humans, making it the bird of choice for those who train the hunters. 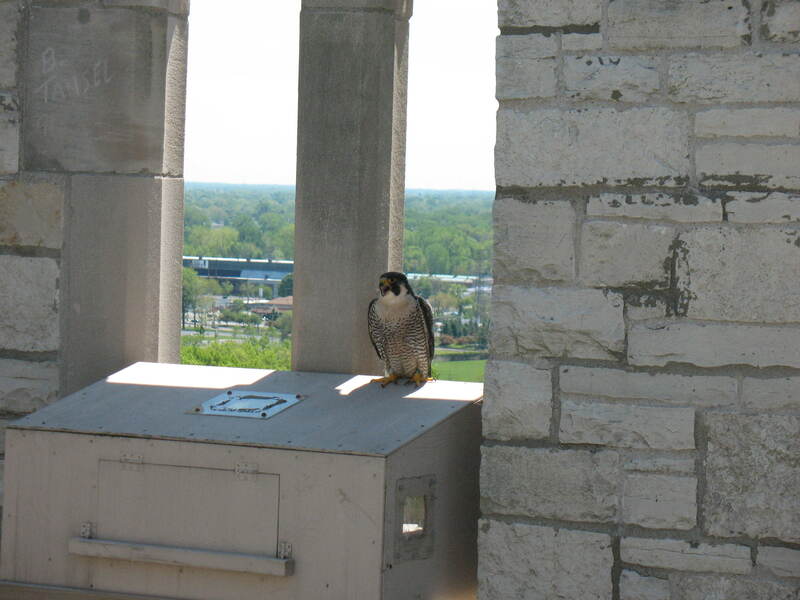 I’ve had opportunities to observe both the ferocious and the friendly side of peregrines while monitoring the nest that’s been atop the University of Toledo’s clock tower since 2007. It’s axiomatic that peregrine parents aren’t afraid to use their speed and their talons to defend their nests during breeding season. 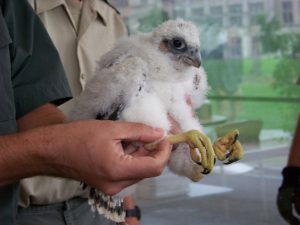 Action-packed videos from UT are available at http://www.utoledo.edu/nsm/envsciences/peregrine/video.html. See staff from ODNR and UT involved in the state’s leg-banding program scramble, dodge and duck to evade attack! Watch them call on an umbrella to momentarily baffle the birds! Peregrines have to be wary of their own species as well. 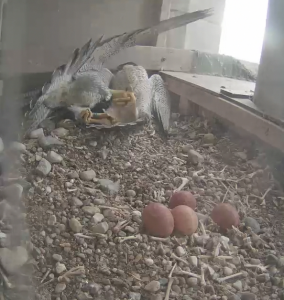 In 2014, Belle, the female adult who had been at the UT nest since its inception, was incubating her brood of eggs when an interloping peregrine tried take over the nest. The resulting bloody fight was captured on camera, and although Belle and her mate Allen successfully thwarted the attack, Belle was injured and two of the scattered eggs that year failed to hatch. However, these same birds are downright tender when raising their young. Thanks to the nest camera, I’ve watched female adults turn their fearsome beaks into gentle combs for downy chicks, and watched as the smaller male birds carefully spread their bodies over a clutch of six eggs when it was their turn at incubation duty. And when the breeding season ends, maintenance staff who have to climb the tower find the UT birds curious but never aggressive. One work crew told me that the birds simply perched on a nearby ledge and observed the action with apparent interest. 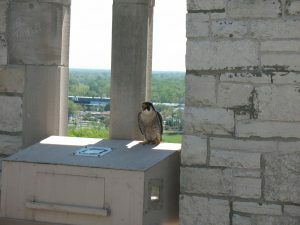 Likewise, a peregrine enthusiast from Jackson, Michigan, shared a story about Chayton, a male peregrine hatched out at UT in 2007 and eventually the patriarch of a nest overlooking this woman’s high-rise office. When the woman would close the blinds in her office, Chayton would begin vocalizing in displeasure until she opened them again. It’s not a stretch to interpret that as a desire to stay in touch with the neighbors. Adult birds at the UT site have hatched and raised nearly 30 offspring. The breeding season begins in February, with eggs usually laid in late March, and hatched about a month later. The chicks begin learning to fly in the late spring. If you visit UT’s Centennial Mall, keep a sharp eye upward and you may be rewarded with the sight of the young birds’ acrobatic flights as they interact with their parents and each other. The adult peregrines patiently teach their fledglings (birds who have fledged, or achieved flight) the ins and outs of obtaining their own food, and if you spend some late-afternoon/early-evening time near a nest, you can see the daily dinnertime rituals. Like any child, the young peregrines prefer to let their parents feed them, and will sit atop a perch on a nearby building and “cry” for a snack. 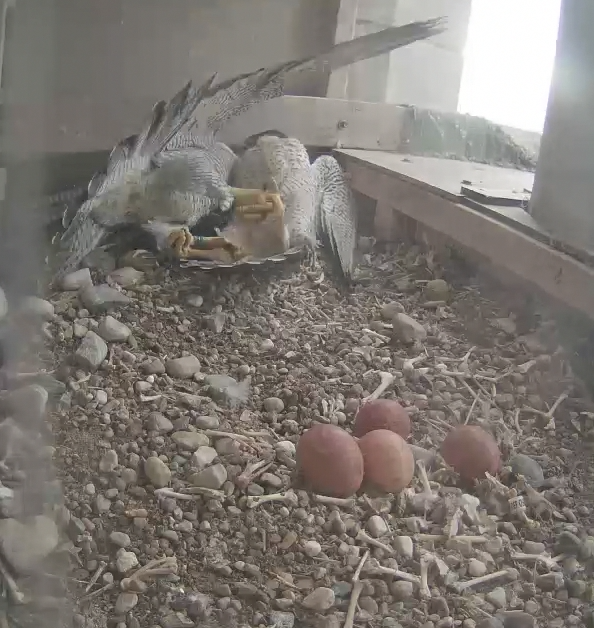 By late September, however, the adult peregrines will have taught their brood the skills to survive; nature will do the rest, and the young birds will be drawn to migrate. Peregrines — the word itself is derived from “wanderer” or “traveler” — migrate vast distances, as far as Central America. If there is sufficient food available, the adult peregrines often remain near their nest for the winter.